This is NOT a sponsored post. Customers are encouraged to share their experience. While the business owner of Jenrich Fast Cargo can provide updated information and feedback. I’m not sure before if I should write a review about balikbayan box shipping companies in Canada. With a quick Google search online, anyone can find mixed reviews about anything. And that’s what I did to find out what people are saying about Jenrich Fast Cargo. Most are satisfied with the service and there are few that said a not-so-good feedback. 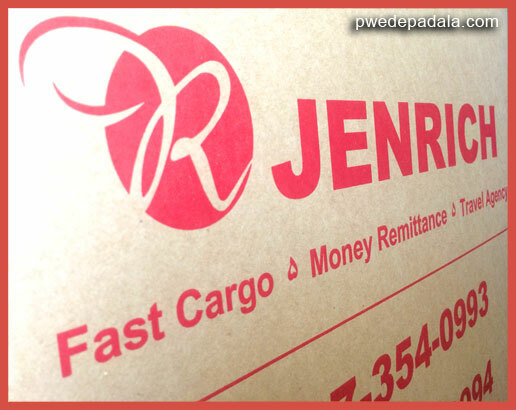 For the benefits of Filipinos looking for shipping companies to send balikbayan box from Calgary, I decided to share my experience and information about Jenrich Fast Cargo in a single blog post. Suspended Rule: The Bureau of Customs has a NEW RULE about duty and tax-free balikbayan boxes. Download the information sheet for consolidated shipments of balikbayan boxes. I’m adding my experience on sending balikbayan boxes through Jenrich with information sheet. If it is your first time to use the information sheet, you should download the information sheet. You will need two copies of the form for EACH boxes. One for Jenrich Fast Cargo and the other is for yourself. Since the boxes were picked up, I didn’t get any call from Jencrich if there was any issue. It only means that my balikbayan boxes were sailing across the ocean to the Philippines. The customer service is reliable. Every time I call to check the available pick up schedule, the staff answers the call immediately. The staff are friendly from the time I call to the pick up date. The balikbayan boxes are always pick up on the set schedule. If the schedule change, I am immediately notified. FREE box replacement except for the small balikbayan box which you can buy for C$5.00. FREE shipping of one box for certain number of boxes. I forgot how many boxes should you send to avail free-charge for a box. You can give them a call especially if you are sending a lot of boxes. I don’t see why you shouldn’t take advantage of the promo. I never had any unfortunate experience in the past since I’ve chosen to send boxes to my relatives in Manila through Jenrich Fast Cargo. The boxes arrived in good shape. Nothing is missing. I don’t complain whether the box takes a long time to arrive in the Philippines or not. The boxes still have to go through the customs and whatever legal process are required so I don’t want to stress myself with duration. Usually it takes from 1.5 – 2 months for the boxes to arrive in Manila. And the longest so far is 3 months. Tip: Make sure to send the balikbayan boxes in the Philippines at least 3 months before the target date to make allowance for any delay or whatever reasons. The company also offer other services such as travel agency and money remittance. I never avail those services because I send remittance through PayPal and I booked my flight online, so I can’t give any feedback regarding the other non-shipping services. For newbies or anyone looking for a better service from shipping companies in Calgary, I would recommend Jenrich Fast Cargo based entirely on my experience. If you want to know more about the company, the information are provided below. If you spot some errors, do let me know. Note: Small box is available for C$5.00 with no box replacement during pickup. Your can avail the FREE box replacement every time your balikbayan boxes are picked up. In my case, I often send two boxes for every shipping so I get to have two free boxes ready to be filled up again within the next six months. The shipping is direct from Calgary to Manila (based on the advertisement). Based on my experience, my relatives receive the balikbayan box from Calgary to Manila within two months. I can’t tell how long it takes in other province. If you are a customer of Jenrich Fast Cargo, leave a comment. Let us know how long it takes for your family to receive the boxes. At times due to some events whether at the port or customs, balikbayan boxes are taking too long to arrive to the destination. It happened to me before but fortunately the boxes arrived at our home in the Philippines. So what are you suppose to do in times like this? First, don’t fret. Second, call the Calgary office for the updates since you cannot track online the balikbayan boxes. Third, call the office in the Philippines. Fourth, try hard not to worry even if you read the next paragraphs because honesty makes a long post. Jenrich broke its shipping schedule for my small balikbayan box. It took 3.5 months for the box to arrive in Manila from Calgary. It included custom inspection or whatever it is called and wherever else the box has been since it disembarked the ship. I thought my small box was lost because of its size. (How rude I am. I know.) My mom started losing hope. But not me. It’s small and (terribly) wandering. With calm phone etiquette, I called the office and react calmer when I found out that a part of the engine has to be fixed. So delayed schedule and consideration was expected. The good news is, my bulilit box arrived in one piece. Safe and unharmed. We stand together, I know of not wanting to read the terms and conditions. But if you are sending a parcel, do yourself a favour. Read and know what you are getting into as a shipper. Perishable and breakable items are shipped at shipper’s own risk. Jenrich Fast Cargo & Services Limited will not be liable for any losses and/or damages, related to this transaction. Shipment(s) may be changed without prior notice. Boxes & parcels are subject to customs inspection. Maximum liability of Jenrich Fast Cargo & Services Limited is C$ 100.00 for regular box and C$ 50.00 for small box on any loss or damage to the shipment or declared value of goods, whichever is lesser. All boxes will remain in Jenrich Fast Cargo & Services Limited custody until all shipment and delivery costs have been paid in full. I found these terms and conditions at the back of the receipt. What strike me the most is how little is the compensation for a loss or damage box. This is terrifying yet I’m grateful that I haven’t loss any box. Can You Send Items that Cannot Fit in the Balikbayan Box? Yes you can. Ask the staff first for tips on how to pack the item and how much is the cost. My bike in sitting in the garage but it is still in good condition. I wondered if I can send it to the Philippines. I was surprised to know that all I have to do is to disassemble the handle and wrap the bike, maybe of plastic. My friend were able to send a flat-screen TV using its packaging. Let me know in the comment if you were able to send anything that doesn’t require or fit in a balikbayan box. Although I give a straightforward feedback without ranting, it doesn’t mean you have to take my advice. Ask your friends about Jenrich Fast Cargo; what do they like or don’t like about the company. In fact, have a well-balanced skepticism. You don’t have to believe somebody, even me. Do your research and listen to your intuition. Share your feedback about Jenrich Fast Cargo. Also how about some tips in packing a balikbayan box. Yung padala ng mother ko until now wala pa rin October pa po yon. Magandang araw sa lahat ng taga subaybay sa column na ito. Gusto ko lang ipaabot sa inyong kaalaman Jenrich Fast Cargo na hanggang ngayon hindi pa rin dumating ang balikabayan box na pinadala ko last week of September at lahat ng numbers sa Manila natawagan narin pero unreachable. Nakailang emails na ako pero isang beses lang may nagreply sakin. Sa paanong paraan ko ba malalaman kung nasaan na ang box ko? Nakakadismaya lang kasi talaga. Walang sumasagot sa cellphone at landline ng Jenrich Manila. Paano ko malalaman kung nasaan na ang padala ng kapatid ko? Nasubukan na ng family na tumawag sa office ng Jenrich sa Manila. Matagal nga daw sila sumagot pero nakausap din nila. Inabot ng 3 buwan bago makarating ang huli kong padala. Dumadating naman lahat ng padala ko pero matagal nga lang. Follow up ko lang ang box ko for Zamboanga City. It’s 4.5 mos na wala pa natanggap! What happen? Hi Florinda. My blog is not in any way affiliated to Jenrich. Anyway, we are in the same state. This week my box is in Manila already and will be delivered soon. Have you tried contacting the office in Manila? My box is still undelivered. It was picked on 1st week of January 2018 here in Regina to Zamboanga City. I don’t know why it took so long/delayed and can’t track my box. We’re in the same situation Florinda. I called Jenrich in Calgary and was informed that something went wrong in the ship’s engine. My box will arrive in Manila on April 8 and my family can call the Jenrich office in Manila to track its location. Hello po kakatanggap lang po ng padala ng mother ko pero hinde po nila natanggap yung small na box. Ano po ba gagawin, kahit nakapirma na mother na natanggap niya na? Sabi din pala ng mother ko yung sa no. of boxes na nakalagay ginuhit guhitan daw ng guy. Contact the Jenrich office in Manila and let them know immediately. Make sure you still have the receipt or better yet scan and send a copy to you mother. Same here. Almost 3 months na hindi pa rin dumating yung boxes namin. Yung contact numbers hindi rin matawagan. Have you tried visiting the Jenrich’s office? I never had a problem other than a delay but I’m grateful na nakakarating naman sa destinasyon yung mga boxes. Recently, I sent a small balikbayan box so I’ll see how it goes. Thanks for sharing the information which will help the people to use Freight Forwarding Service. I didn’t use the service yet, but I hope that I will use it in recent future. But Recently my friend use the service from Globalistics Philippines & he suggested me to take this. So I planned to use the service from them. Glad to know more freight companies in Calgary. Thanks Rodriguez. If you did avail the service of Globalistics Philippines, I hope you don’t mind if you could share your experience and details about the company for our kababayan. Thanks again. Past 2 months na wala pa yung package na padala ng Mr. ko 4/29/2017 pa pinadala. July 11 na! Hi Generosa. You can contact the Calgary and Manila offices of Jenrich for updates. The contact information is on the blog post. Based on my experience it usually takes 2 months for the boxes to arrive in Manila and much longer in provinces.